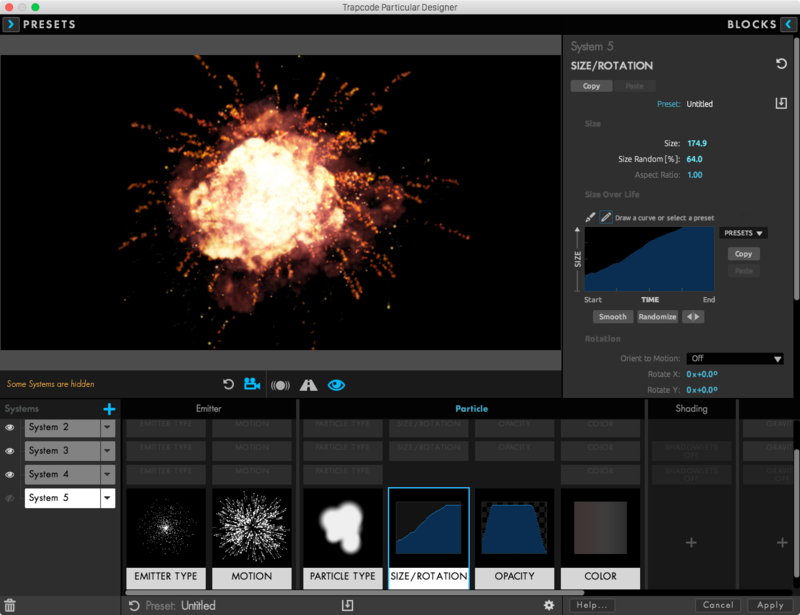 Multiple Systems allow you to create significantly more powerful and complex particle systems. In a nutshell, Multiple Systems is like having many instances of Particular in a single effect. But it’s even more powerful than that. Not only can each secondary system contain it’s own set of controls like an emitter, aux particles, physics, etc., but these additional systems can also “inherit” the properties and behaviors of the Master System. For example, if you’re emitting particles with an OBJ emitter, you could create an additional system that created particles independent of that OBJ emitter, or particles that also emitted from that same OBJ. For every instance of Particular, you can have up to 8 systems (one Master System and 7 secondary systems). Multiple Systems allow for much more richness in Particular than has been possible before. In the next page, we’ll look at how to work with Multiple Systems in the Particular UI (in the Effects Controls panel in After Effects). But the recommended way to both create and work with Multiple Systems is in the Designer. The Designer allows for much more flexibility and ease of use when working with Multiple Systems. Additionally, there are several features (such as duplicating systems or saving system presets) that are only available in the Designer.